Thank you for all the help & guidance that has brought Tommy into our home. He has been a ray of sunshine and is just terrific. Diane is so happy with him and is smiling again. I admire the dedication you've given these great dogs for so many years. Thank you from Rumor, Stormy, Clarence, Blondie & Henry... and from Tommy. Thanks for being a friend! 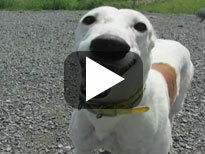 Make Sure a Greyhound is the Right Dog for You! 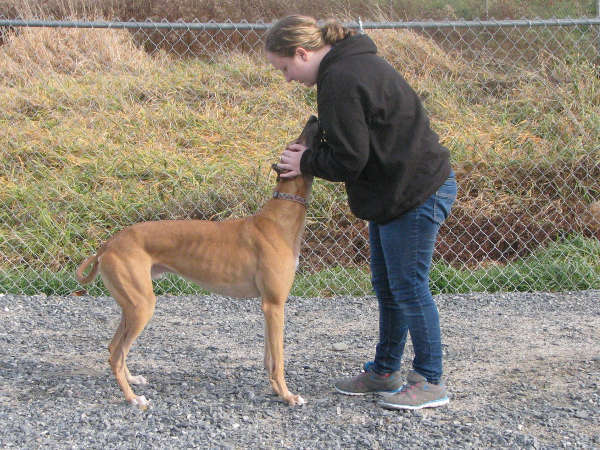 Meet a Greyhound at one of our many Pet Store sponsored informational meets and greets. Click here for list of events. What is your new adopted Greyhound thinking? This breed has never been asked to do anything for itself, make any decisions or answer any questions. It has been waited on, paw and tail. 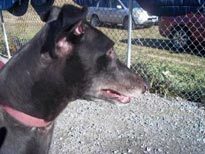 The only prohibition in a racing Greyhound's life is not to get into a fight -- or eat certain stuff in the turnout pen. Let us review a little. From weaning until you go away for schooling, at probably a year and a half, you eat, grow and run around with your siblings. When you go away to begin your racing career, you get your own "apartment," in a large housing development. No one is allowed in your bed but you, and when you are in there, no one can touch you, without plenty of warning. Someone hears a vehicle drive up, or the kennel door being unlocked. The light switches are flipped on. The loud mouths in residence, and there always are some, begin to bark or howl. You are wide awake by the time the human opens your door to turn you out. A Greyhound has never been touched while he was asleep. You eat when you are fed, usually on a strict schedule. No one asks if you are hungry or what you want to eat. You are never told not to eat any food within your reach. No one ever touches your bowl while you are eating. You are not to be disturbed because it is important you clean your plate. You are not asked if you have to "go outside." You are placed in a turn out pen and it isn't long before you get the idea of what you are supposed to do while you are out there. Unless you really get out of hand, you may chase, rough house and put your feet on everyone and everything else. The only humans you know are the "waiters" who feed you, and the "restroom attendants" who turn you out to go to the bathroom. Respect people? Surely you jest. No one comes into or goes out of your kennel without your knowledge. You are all-seeing and all-knowing. There are no surprises, day in and day out. The only thing it is ever hoped you will do is win, place or show, and that you don't have much control over. It is in your blood, it is in your heart, it is in your fate-- or it is not. And when it is not, then suddenly you are expected to be a civilized person in a fur coat. But people don't realize you may not even speak English. Some of you don't even know your names, because you didn't need to. You were not asked or told to do anything as an individual; you were always part of the "condo association"; the sorority or fraternity and everyone did everything together, as a group or pack. The only time you did anything as an individual is when you schooled or raced, and even then, You Were Not Alone. Suddenly, he is expected to behave himself in places he's never been taught how to act. He is expected to take responsibility for saying when he needs to go outside, to come when he is called, not to get on some or all of the furniture, and to not eat food off counters and tables. He is dropped into a world that is not his, and totally without warning, at that. Almost everything he does is wrong. Suddenly he is a minority. Now he is just a pet. He is unemployed, in a place where people expect him to know the rules and the schedule, even when there aren't any. (How many times have you heard someone say, "He won't tell me when he has to go out." What kind of schedule is that?) Have you heard the joke about the dog who says, "My name is No-No Bad Dog. What's yours?" To me that is not even funny. All the protective barriers are gone. Now he is left alone, for the first time in his life, in a strange place, with no idea of what will happen or how long it will be before someone comes to him again. If he is not crated, he may go through walls, windows or over fences, desperately seeking something familiar, something with which to reconnect his life. If he does get free, he will find the familiarity, within himself: the adrenaline high, the wind in his ears, the blood pulsing and racing through his heart once again--until he crashes into a car. Often, the first contact with his new family is punishment, something he's never had before, something he doesn't understand now, especially in the middle of the rest of the chaos. And worst of all, what are the most common human reactions to misbehavior? We live in a violent society, where the answer to any irritation is a slap, punch, kick, whip, or rub your nose in it. Under these circumstances, sometimes I think any successful adoption is a miracle. He is, in effect, expected to have all the manners of at least a six-year old child. But, how many of you would leave an unfamiliar six-year old human alone and loose in your home for hours at a time and not expect to find who knows what when you got back? Consider that if you did, you could be brought up on charges of child abuse, neglect and endangerment. 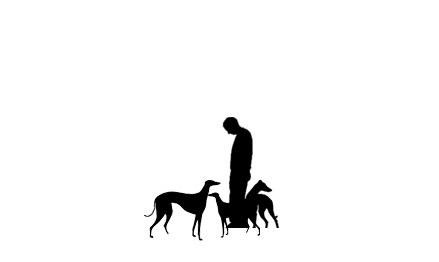 Yet, people do this to Greyhounds and this is often the reason for so many returns. How many dogs have been returned because they did not know how to tell the adopter when they had to go out? How many for jumping on people, getting on furniture, counter surfing, separation anxiety, or defensive actions due to being startled or hurt (aka growling or biting)? So, let's understand: Sometimes it isn't the dog's "fault" he cannot fit in. He is not equipped with the social skills of a six- year old human but you can teach him. With love. We now have a YouTube feed!